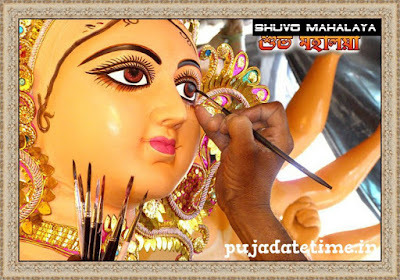 Durga Puja "Worship of Durga"), also referred to as Durgotsava "Festival of Durga") or Sharadotsav is an annual Hindu festival in South Asia that celebrates worship of the Hindu goddess Durga. It refers to all the six days observed as Mahalaya, Shashthi, Maha Saptami, Maha Ashtami, Maha Navami and Vijayadashami. in whatever YOU do & wherever YOU are! May Maa Durga Durgatinashini bring joy to you and your loved ones. May the divine blessings of Maa Durga be with you always! Jai Maa Durgaa, Maa aapki har monakamana puri karein. May all your problems solved of your life. Wish You Happy Durga Puja.